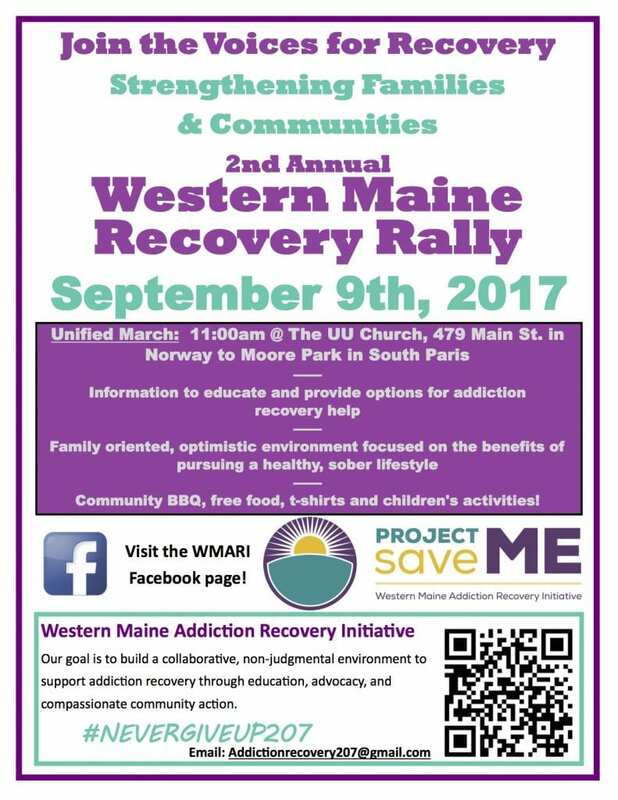 Please join us on Saturday, September 9th for the Second Annual Western Maine Recovery Rally and show your support for recovery! All are welcome! We’ll be building on the success of our first rally last year and following the same format. We’ll gather at 11:00 for a unified march from the Unitarian Universalist Church at 479 Main St in Norway to Moore Park in Paris. At the park there where will be a rally with free food and children’s activities, and the chance to hear from several speakers who will share stories of hope and recovery. Transportation will be provided to get people back to the starting point. We’re also offering rides to the rally from the River Valley and Fryeburg areas! A bus will be depart at 10:00am from Common Ground Counseling at 89 Main St. in Mexico. Another bus will depart at 10:00am from Common Ground Counseling in Fryeburg at 639 Maine Street. Both buses will offer return rides when the rally concludes (around 2:00pm). To save a spot on the bus, or for more information, please contact Michelle Roberts at addictionrecovery207@gmail.com or 381-0486. We look forward to seeing you there! Signature sponsorship for the event is provided by the New England Addiction Technology Transfer Center. Need help finding the rally, or where to park? Check out this handy map!